Virtual Racks allow clusters of servers to work together, providing the most cost-effective solution for customers who require unlimited server-to-server connectivity, pooled bandwidth and advanced firewalls and load balancers. Create a custom Virtual Rack solution, or take advantage of our pre-configured Virtual Rack solution bundles! ITatOnce can assist San Diego area businesses of all sizes, whatever their IT needs. All Virtual Rack servers come with a 100Mbps public network uplink and an unmetered 100Mbps private network connection, both of which are upgradable to 1Gbps. Unlimited Server-to-Server Transfer – Multiple servers within the same Virtual Rack solution have dedicated and unlimited connectivity so you don't pay for bandwidth between servers. Reduced Risk of Bandwidth Overages – Virtual Rack solutions pool bandwidth across all servers in the environment. No more guesswork about which of your servers will have a bandwidth overage and which will not even reach their bandwidth limit! Access to Advanced Security and Hosting Technologies – A complete hosting solution for complex environments requires advanced firewalls, load balancers and storage solutions. 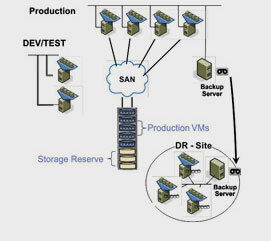 Our Virtual Rack solutions provide all of these, across multi-server applications. Scalability and Customization – Using a Virtual Rack allows you to respond quickly to changing business needs. Need additional servers at a moment's notice? Looking for a new, secure network for internal communications? We can provide a solution far more quickly than you could on your own. Globally Redundant Infrastructure Options – By using a combination of multiple data centers and advanced load-balancing technology, our Virtual Rack offerings distribute applications across the data centers in our Houston, Dallas and London facilities. Well-designed, functioning applications require redundancy and scalability. ITatOnce’s Network and server load balancing makes adding redundancy and scalability to your Virtual Rack network a snap. Load Balancing enables a group of servers to intelligently distribute service requests to a single domain name or address, which ensures significantly greater performance from your servers. Ability to Scale – Load balancers allow you to manage your IT infrastructure more efficiently as your traffic increases. Flexibility – Load balancing and fail-over services are built in to a single appliance, which allows you to expertly balance performance and redundancy. Expert Management – Our experts set up, configure, monitor and maintain our load balancers and perform regular firmware upgrades to them. Extra Level of Security – Load balancers control the amount of traffic a particular server receives, which increases the availability of applications, and prevents abuse and attacks without blocking legitimate traffic. Load Balancer Management – Complex network configurations require an expert management team around the clock. Our highly skilled load balancer management team supports your specialized deployment 24/7. Storage Cloud is a unique offering that combines the speed and flexibility of on-premise Network Attached Storage (NAS) with global access and the usage-based billing model of a cloud storage product. Fast, On-Premise Storage with Cloud Capabilities – The more storage you use, the deeper the discount you get. On-premise storage is also accessible "via the cloud," which reduces server resource utilization and the need for a separate cloud account. Get Data Closer to Your Customers – We offer the industry's only geographically-distributed cloud storage platform or Storage Delivery Network (SDN). If you have a storage-intensive business or website, you can increase data transfer speeds dramatically by storing data closer to the user. With storage nodes across the U.S., in Europe and Asia, we make this easier than ever before. Simple Management and Integration – By providing you a single account for managing your hosted environment and cloud storage platform, Storage Cloud provides an integrated experience unmatched by other hosting or cloud storage providers. Our standards-based Storage Cloud platform supports CIFS, NFS, FTP and HTTP, as well as an extensible API streamlining integration. Cost-effective Disaster Recovery, Backup and Archiving Repository – We protect your business from all types of disasters - from human error to loss of network connectivity, and everything in between. Flexibility - Virtual Racks are the perfect platform to power your application by providing flexibility to scale up as your infrastructure needs grow. Off your plate and onto ours - We provide the data center, network, and all the servers and hardware support you need, freeing you up to focus on your own business. Instant Scalability for Multi-Server Environments – Hosting servers in our Virtual Rack infrastructure give you the utmost flexibility to quickly add servers as soon as they are needed. Our private back-end network ensures all servers are linked and can communicate securely. Load Balancing for Increased Performance – Leverage load balancing options to offload session management and enhance the performance of your Web servers. We monitor all of your available servers to be sure they are managing your Web traffic optimally. Storage Cloud Provides a Globally-available, Scalable Storage Platform – Use our Storage Cloud to access storage-on-demand that is replicated in up to five cities around the world. With our simple, usage-based billing model, you pay only for what you use. You cannot afford the risk of intrusion or threats to your servers that could compromise the confidentiality and integrity of your data. The security experts at ITatOnce will configure a firewall solution that builds just the right extra layer of defense for your servers. Expert Deployment and Management – Our experts set up, configure, monitor and maintain all firewalls and perform regular firmware upgrades to them. Secure Remote Connectivity – VPN services through a firewall appliance provide strong encryption and authentication and secure communication privacy with IPSec VPN functionality. Meeting Compliance Requirements – Compliance mandates, such as the Payment Card Industry (PCI) Data Security Standard, require a firewall to protect critical data. Let ITatOnce’s experts assure your business is in compliance. Direct Attached Storage (DAS) is an extremely versatile dedicated solution that solves a number of storage problems. It is most commonly used to enable server expansion and low-cost clustering. For instance, if your server is running out of space, adding a DAS that can support up to 15 drives could be the perfect solution. Application and database throughput is increased with the higher spindle count a DAS provides. Flexibility to scale as you grow – Everyone wants to keep start-up costs low. Why pay for more capacity than you need right now? With DAS, you simply add drives and devices as your needs expand. Dedicated Performance – The beauty of Serial Attached SCSI (SAS) architecture is in its instant response and extreme speed. SAS drives, optimized for performance applications, and Near-Line SAS drives, provide capacity at a great price point. Versatility – a single DAS can service both database and large file-storage needs, allowing you to mix both drive types and sizes using just one device. ITatOnce Virtual Rack solutions are designed to meet the needs of multi-server, multi-tiered Web applications. We also offer fully-customized dedicated environments via Private Rack solutions for businesses that require more advanced configurations.